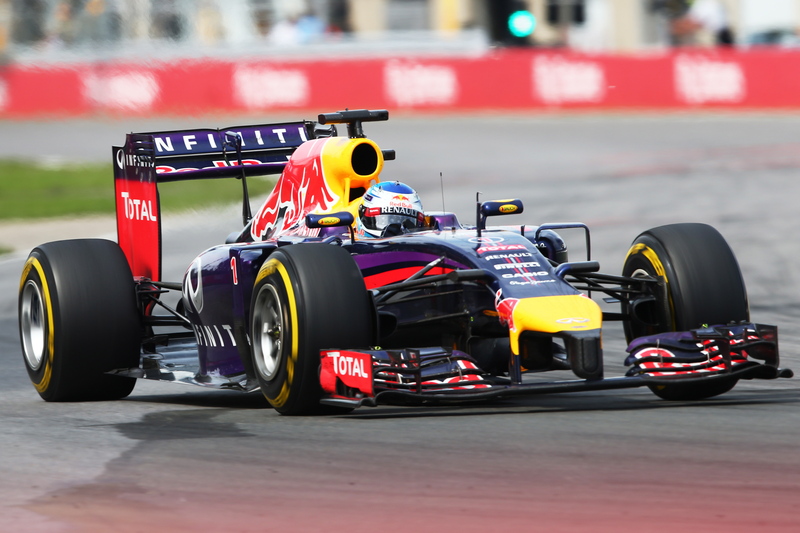 Daniel Ricciardo scored a sensational first win at the Canadian Grand Prix, the Australian fighting his way past Force India’s Sergio Perez and the ailing Mercedes of Nico Rosberg to claim a first win of the season for Infiniti Red Bull Racing in a thrilling encounter in Montreal. Sebastian Vettel completed an excellent outing for the team, finishing in third place. The champion battled past Perez two laps from home but didn’t get a chance to take the fight to Rosberg as a last lap, high speed crash involving Perez and Williams’ Felipe Massa saw the race end under the safety car. After a steady start in which Dan held his starting position of sixth, the race really came alive in the last 30 laps. Despite an early move to second place by Sebastian at the start, the Mercedes pairing of Nico Rosberg and Lewis Hamilton held sway at the front for the bulk of the of first half of the race, Seb being passed again by Hamilton on lap 10 under DRS. But on lap 36 Hamilton’s times began to drop and the Briton was quickly on the radio telling his team he was losing power. Surprisingly Rosberg quickly repeated the complaint to the Mercedes pit wall. Hamilton’s race went from bad to worse a handful of laps later. 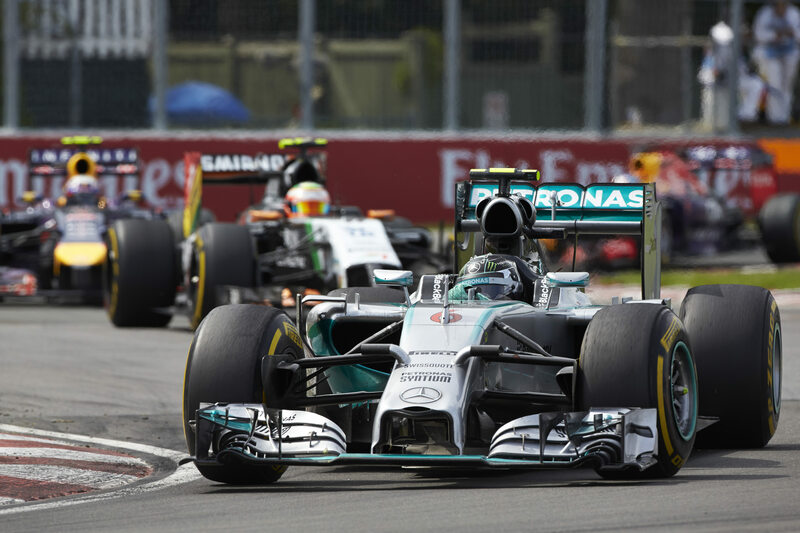 During the second round of stops he managed to jump ahead of his teammate when Rosberg had a problem in pit lane. However, he soon handed the position back as brake issues saw him first run wide at the hairpin and then overshoot the chicane. By lap 46 the problems had become terminal and he was forced to steer his car back to the pit lane to retire. Rosberg, meanwhile, was falling back into the clutches of his waiting rivals, and by lap 60 there was just half a second between him and Perez in second position. 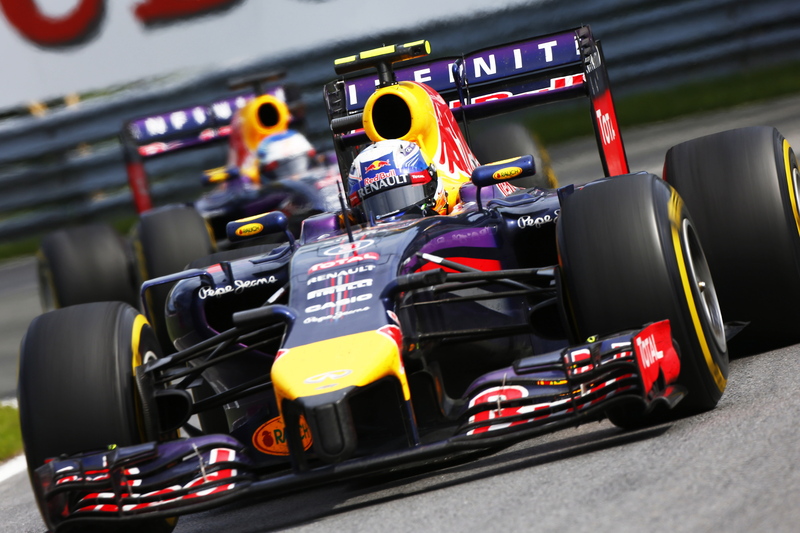 Daniel and Seb were closing in also, the pairing having climbed to fourth and fifth. Massa too would soon join the fray and as the race finale approached a four-car train formed up behind the faltering Mercedes of Rosberg, all determined to take a shot at victory. With Perez dealing with failing brakes it was Daniel who made the decisive move. Despite being down on power on the straights to the Force India, he picked his spot expertly and in a bold overtaking move forced his way past through turn one. He then set about chasing down Rosberg and the German soon came into view. Daniel made his move on lap 68 and brushed past the Mercedes to assume the lead and march to victory. Seb, meanwhile, was making his own move on Perez. He got past the Force India man two laps from home and was surely contemplating hunting down Rosberg. He didn’t get the chance, however, as on the penultimate lap Massa attempted his own overtaking move on Perez. The Mexican, though, made a small course adjustment as he approached turn one and the two cars made contact. Both were pitched off-track at high-speed and hit the barriers hard. The safety car was immediately deployed and the race ended under the caution. 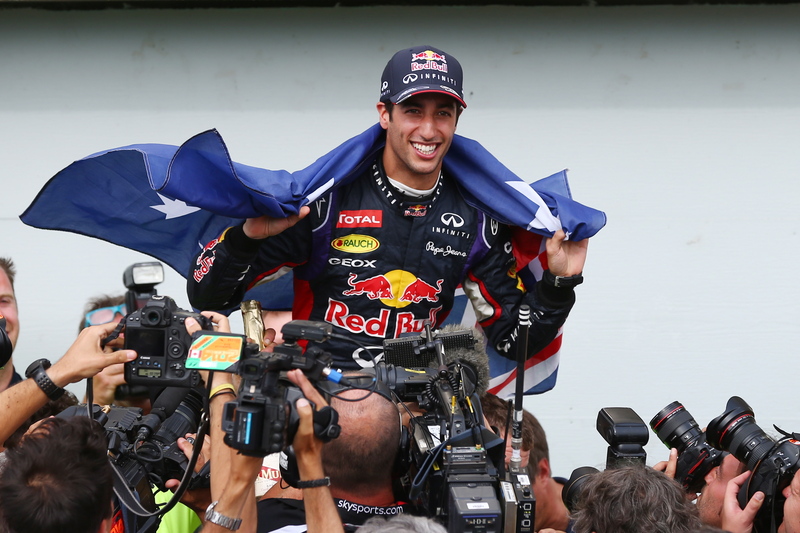 Afterwards Sebastian was full of praise for his teammate on the occasion of his first win. Team Principal Christian Horner also hailed Daniel’s performance, adding that the young Aussie has been a revelation since joining the team at the start of the season. “An amazing race today and what an amazing race for Daniel to win his first Grand Prix. He’s been phenomenal since he joined the team and I think today he fully deserved the victory,” he said. “We benefited from the misfortune of Mercedes, but nonetheless he still had to be there and his pass on Perez was the deciding moment in the last ten laps. He was then able to make an easy pass on Nico with a couple of laps to go and to win in Montreal, against all expectation, was a phenomenal result. As for Daniel, he was due to fly out of Montreal this evening, but we have a sneaking suspicion he might be ditching that particular flight in favor of a small celebration.